Pink's Thinks: Cuppa Pesticide Carcinogen Tea, Anyone? It was a dark and stormy night... No. Actually, it just felt like a dark and stormy night. It felt like the worst day ever. How could they do this to me? How could I not see it before? It was horribleness wrapped up in an innocent bow and the devastation of the truth of it made me question pieces of my very person. What, pray tell, you ask? Wha? Yes. Pesticide tea. I have been drinking pesticide tea. AND I DIDN'T EVEN KNOW IT. Now for some of you, you're thinking, "Big deal! Just get some new tea. Solved." Yes. I know. And I did. BUT. You do not understand my relationship with tea. I love tea! Tea and I hang out every morning. We are homeboys. I have a teeny kitchen and I have dedicated an entire cupboard to my teas. I put less used kitchen items out of my kitchen into the basement while tea stood proudly by, showing its importance and priority and sticking out its tongue at the pie plate. And I totally let it. People come over to my house and when we sit down for some dessert or for a chat, I bring out The Tea List. 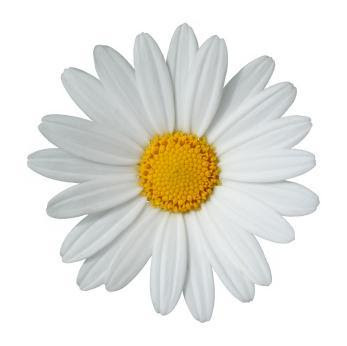 People say to other people, "Have you been over to Ms. Daisy's house for tea? She has a tea list!" I have organized my teas into category (black, green, white, herbal, rooibos, pu-erh, oolong, etc.) in descending order of caffeination groups. The bottom of the sheet has an explanation of the process of how various tea types are made (dried, withered, pan fried, fermented, etc.) in a handy-dandy flow chart. 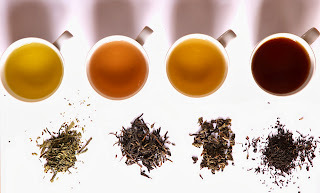 Then, of course, I obey the proper temperature rules for each type of tea to serve up the perfect cuppa. I do not collect ANYTHING...except for tea cups and tea pots. I would probably throw out my plates before I would throw out a tea cup. And I think the general idea of collecting is for ninnies who wish to one day graduate to a full-fledged hoarder, so it is with great love that these things get by in this house. And so, Friday was rather disturbing to say the least. I was reading on Food Babe's blog and laughing at her hilarious conversation with Lean Cuisine regarding their use of GMOs, while claiming that their product is "100% natural". (I'm glad I'm not the only one who calls companies to ask them questions like this.) Then, I ventured over to read about Trader Joe's and how even though they claim they are non-GMOers, that they don't disclose any information to prove it. This is also disturbing, but the last one put me over the top. The side bar tempted me with, "Do You Really Know What's In Your Tea?" "Oh no." I thought. "No, not tea too! Isn't anything sacred anymore!? What could there possibly be with tea? Do I even want to know?" I thought I was pretty good. I thought I had a mostly clean lifestyle. I make my own laundry detergent, lotions, deodorant and pick only EWG safe makeup to avoid putting the chemmicals on my body. I eat organic fruits and veggies, and when possible, choose local organics (even if they're not certified - I just ask the farmer what they're doing, and if it passes the standards, it's in.). I drive crazy distances to get eggs from someone's free-ranging back yard, get grass fed beef from a farmer I know and milk from the same. I only eat organic chicken (gotta avoid the heavy metals in the conventionally raised ones *cough*cadmium*cough*) and get out to the farmer's markets when I can to get local, free range chicken. The last time I had a sip of pop was over a decade ago, and we go out to eat about 4 times a year (it would be zero, but there are other people in the house who like it on occasion). The vitamins we eat are from organic food-based sources. I make kombucha, for cyring out loud! I got rid of the microwave, I never use plastic with food and I've cut the use of white sugar and flour almost 100% in our house. I mill my own grains to bake bread with and can the veggies that grow in the garden. But THIS! This! I overlooked it! HOW could I overlook it? I don't know. Until last Friday. Sad Friday. Sad eyeball-opening truth Friday. I thought I was safely out of the last frontier and then this one came about. I clicked on it, hoping it wasn't quite so bad. Let's start out with the fact that most tea isn't washed off before it is bagged up and almost all tea is sprayed with pesticides. 91% of Celestial Seasonings teas were tested by a third-party and found to be over the allowable pesticide limit. Their Sleepytime Kids Goodnight Grape Herbal contained a pesticide called propachlor (at 0.26 ppm), a known carcinogen under California's Prop 65. Their Wellness teas contained propargite, another carcinogen and developmental toxin. Wow. What wellness you have there, Mr. Fox. I went to the cupboard and pulled those out. Bummer. That was like 9 boxes. But I did get it from the grocery store, so I figured my loose teas would be safe. After all, I got them from Teavana. Guess what tea brand Food Babe exposed next? Yep. Teavana. I would think they would be a bit better than Celesital Seasonings, however. Let's try worse. 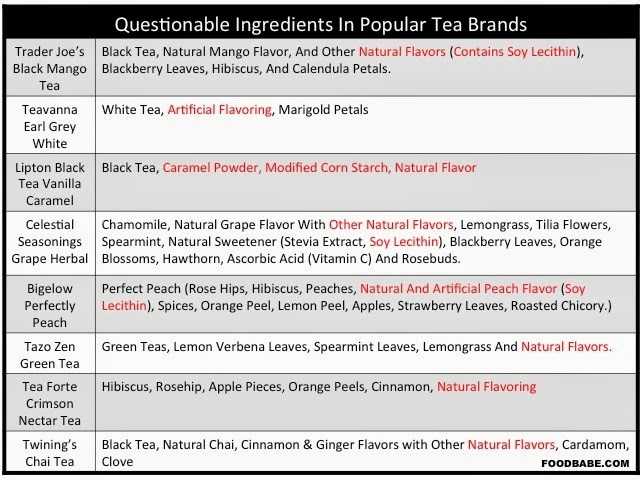 One hundred percent of all Teavana teas contained pesticides. ONE HUNDRED PERCENT. Every single one. Every beautiful canister. 100%. All. As in, if you've got Teavana in your stash, you've got pesticides. 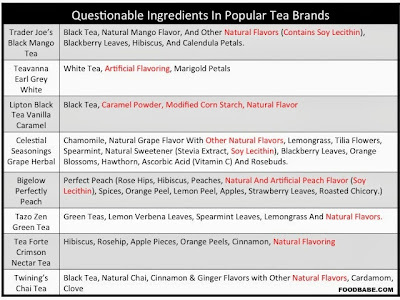 62% of their teas contained endosulfan, a pesticide that was banned in the U.S., China, the E.U. and 144 countries because of its danger to the unborn. It has been linked to impaired fertility and harming unborn babies. Monkey Picked Oolong (the super expensivest one) tested positive for 23 different pesticides. Glad we paid a bit more for poison. Not. They also throw in artificial flavors. That's not very high-end of them. Well, maybe you don't care too much about sticking pesticides into boiling water and drinking it, so let's talk about the other danger with tea - their bags. You've either got the cheap papery-type or the fancy "silky sachets" (which sometimes are advertised as "biodegradable". You'd think the silky sachets are uber high end and you're safe. Hello, didn't we already learn that lesson with Teavana? Silky sachet bags are either made from plastic (hi, BPA!) or (GMO likely) corn. If they're made from food grade nylon, then we have to deal with PET (polyethelyne terephthalate). Stick that in your boiling water and leach it. Plastic breaks down at those higher temperatures. If it is there, it's getting in your tea. Well, then, phew. Paper bags must be a-okay. WRONG. Most of the paper tea bags are treated with something called epichlorohydrin. This is an ingredient in epoxy resins and is a fantastic multitasker as a pesticide. Bad news. When it comes into contact with water (HELLO? ), it changes to 3-MCPD, which is a carcinogen, causes suppressed immune function and kills male sperm cells. Buy organic. Call tea companies you love and ask them what kind of crack they're on. If you have an organic tea and it is in a toxic bag, cut open the bag and steep your tea in one of those little stainless steel mesh thingies. 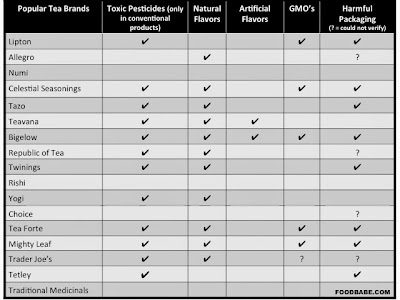 Buy teas that don't contain GMOs. Tell your friends and family and save their lives. Serve them the good stuff. For me, I sat on the kitchen floor like a sad puppy while I checked brands and pulled them all out of the cupboard. I put the 40+ teas into a bag and gave them away (even though I warned people that I was giving them away because of pesticides...). I went to the health food store and bought a small pile of organic teas and have been trying them out. I am sad about missing my favorite tea, Typhoo, but perhaps one day they'll all come around. Until then, I've got to work up a new collection and organize and formulate a new and improved tea list.